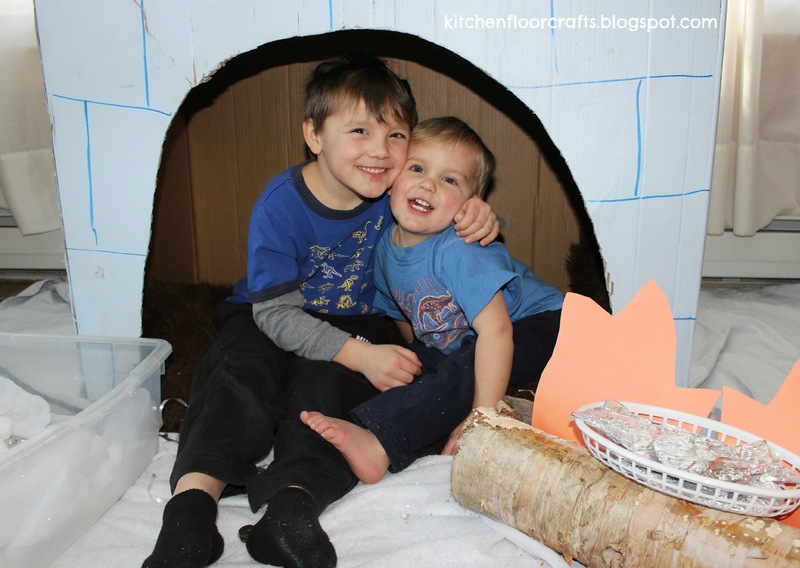 We love cardboard box play and take any opportunity we can get to grab a big box for really fun activities. So when we offered a freezer box around the holidays, of course we couldn't turn it down. 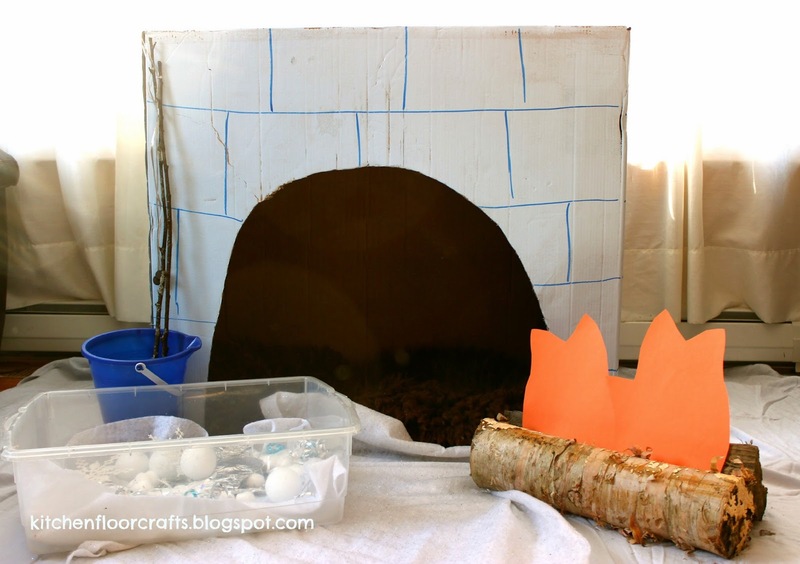 With a little paint and imagination, we turned our box into an igloo! Big Brother has been really enjoying some weekend ice fishing with Daddy, and liked the idea of extending it into play at home. 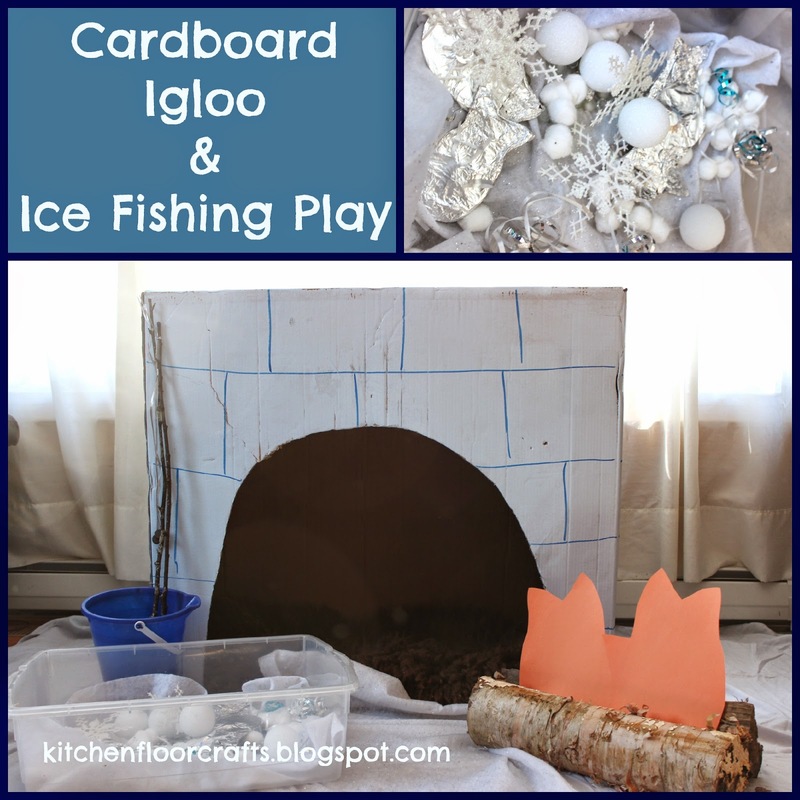 This inspired us to turn our box into an igloo and add some fishing fun too. 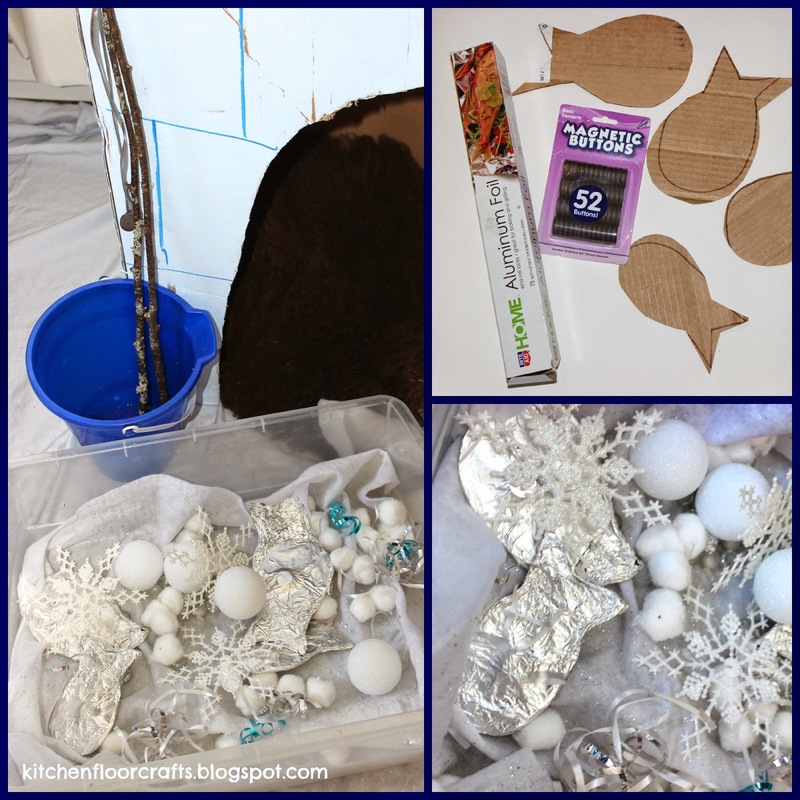 To begin with, I added a light coat of paint to the box when I was repainting the boys' bedroom. After the paint dried I used permanent marker to draw lines (ice blocks) onto the box. We also cut a half circle out of the front and added a sheep skin rug onto the floor. For the fish I used scraps of cardboard to cut out a small handful of fish. I used hot glue to attach round magnets onto one side of the fish. After it cooled I wrapped the fish in tin foil. For the fishing poles I collected a few sticks from outside. I glued two magnets together with a string down the middle and tied the string to the end the sticks. 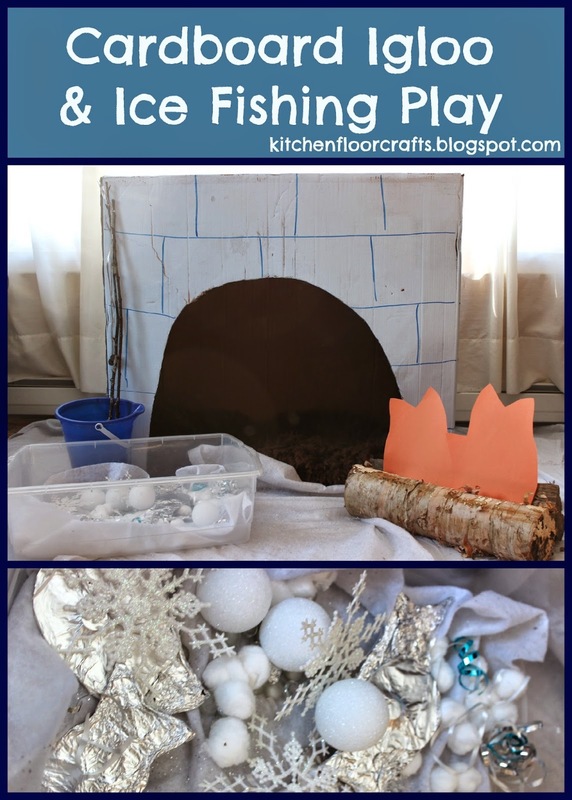 The fish were added to our "lake" which included fabric snow, cotton balls, styrofoam balls, snowflakes, clear marbles, and scraps of curling ribbon. I was trying to set it all up with the two boys watching, and they couldn't wait to get in and start playing. Afterwards they pretended to cook their fish (trout and bass Big Brother decided) on the fire. Later they "slept" in the igloo, did some more fishing and cooking, and got some stuffies to add to the scene. 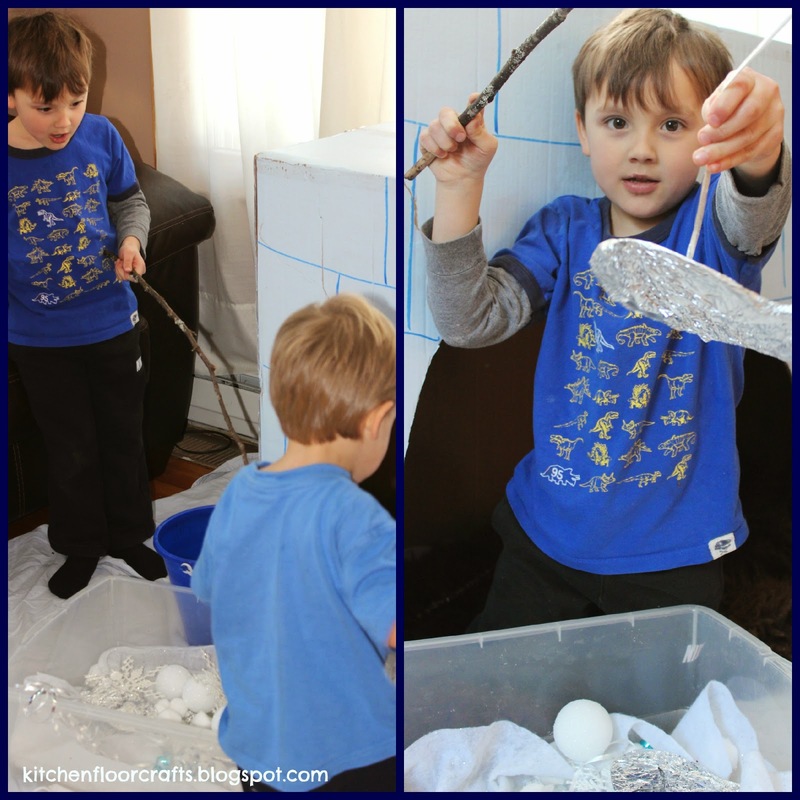 Big Brother also made a toss game using the bucket and the styrofoam balls. We kept the scene up for most of the day, and the igloo for about a week. Big Brother even took quiet time in the igloo a couple of different times. 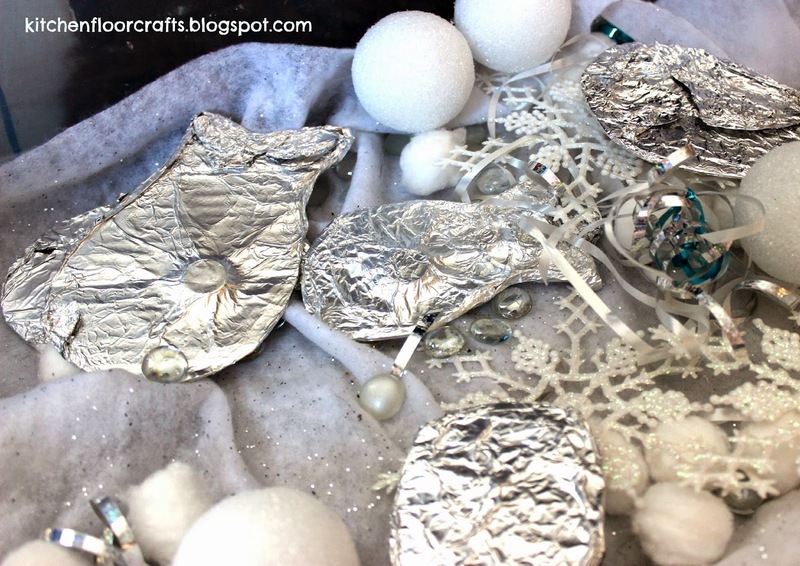 Definitely a fun way to create a winter scene and activity, inside! What's the best way you and your kiddos have ever used a large box? 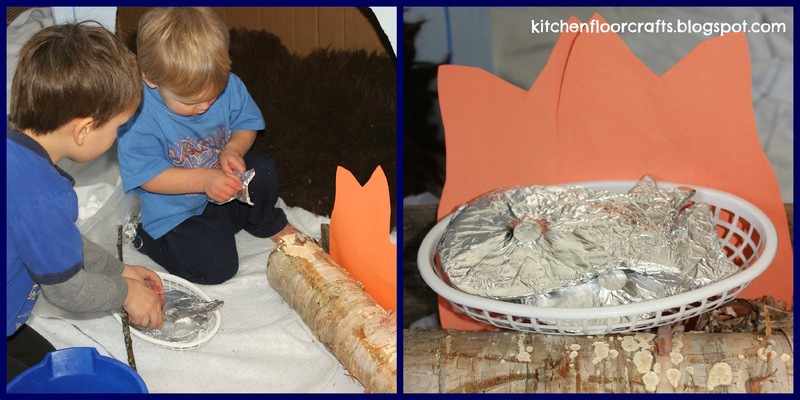 I love this idea, I know my kids would love it.